One of my best friends since high school, K, is expecting her own sweet little man in November. So, friends C, L and myself put together this sweet shower for K and Baby Henry. 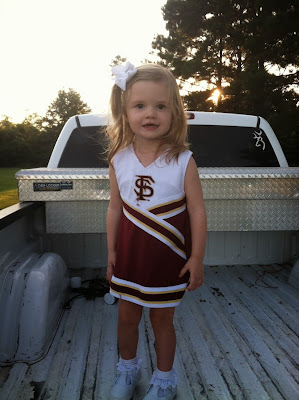 Here are the details–and the adorableness, if I do say so myself. And I have to give props to Amanda at Dixie Delights for the idea behind this shower. You can see her original ideas here. 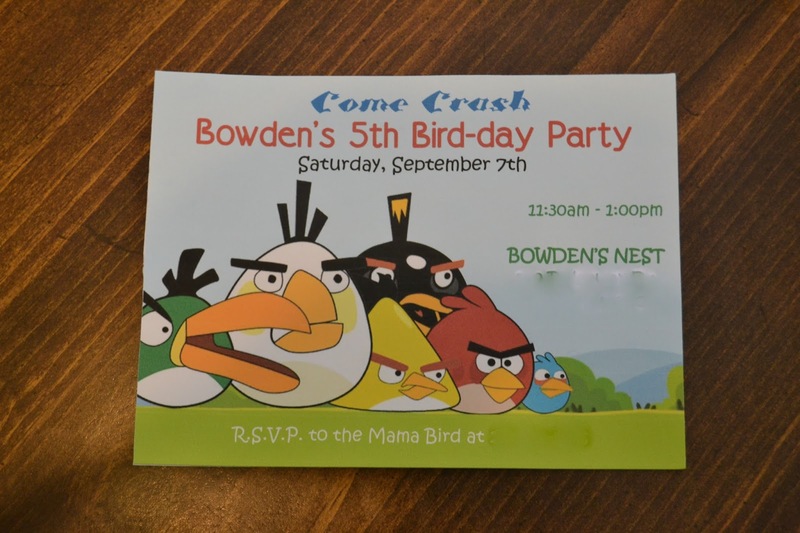 L took care of the invitations which I think turned out pretty precious. In keeping with the Southern theme, we served Southern foods–cheese straws, chicken salad sandwiches, pimento cheese sandwiches–and some standard shower foods like fruit and nuts. And of course the ever-so-chic-these-days cupcakes were a part of the spread as well. I made the little blue bowtie toppers with toothpicks and some hot glue, and they were adorable. L brought the pretty plant as the centerpiece and it looked gorgeous–and the blue and white container matched my kitchen PERFECTLY. We kept the drinks Southern as well with Amanda’s great sweet tea bar idea. I LOVE this and definitely see more sweet tea bars in my entertaining future. I made the lemonade myself. It was my first time making homemade lemonade, and it came out sweet and tart and nicely refreshing. I had lemon wedges, lime wedges, and mint leaves in the small silver handled bowl set. I was also able to pull out my wedding crystal which was nice. And I have a friend with the same pattern, so she loaned me a few of her glasses so I would have enough. The shower was lovely, and we had a blast. Several high school friends from out of town made it into town, and it was so wonderful to see them all again. K got some sweet outfits, some really useful stuff like diapers and bibs, and the three hostesses were able to go in together and get her the much needed Pack n’ Play. K and I have been friends for over 16 years!!! I can’t believe it. I am so excited for her and her husband and just can’t wait to get my hands on sweet baby Henry. As part of one of his birthday gifts, B got an Angry Birds kite. Since we have tons of trees (and power lines) in our front and back yards, we could not fly it right away. 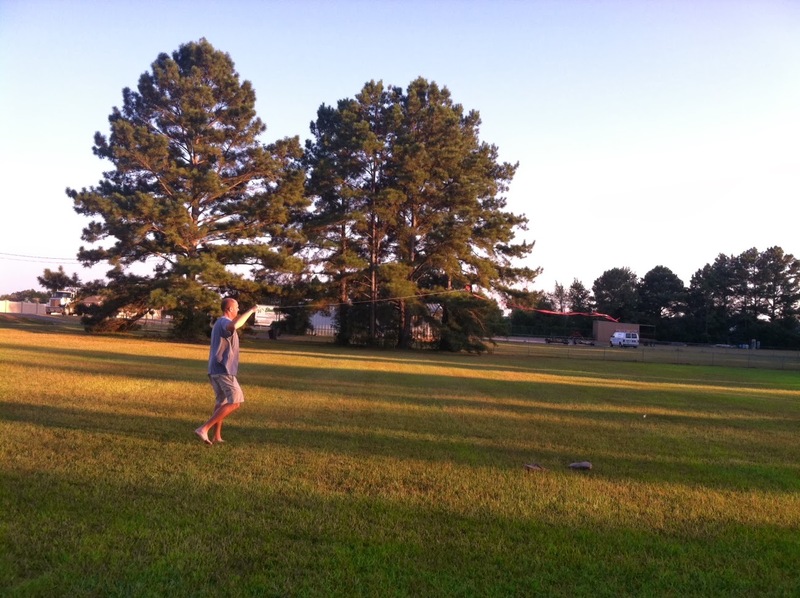 Fortunately, our church has a large empty grassy area right next to the parking lot that is perfect for Ultimate Frisbee, flag football, volleyball, and kite flying. 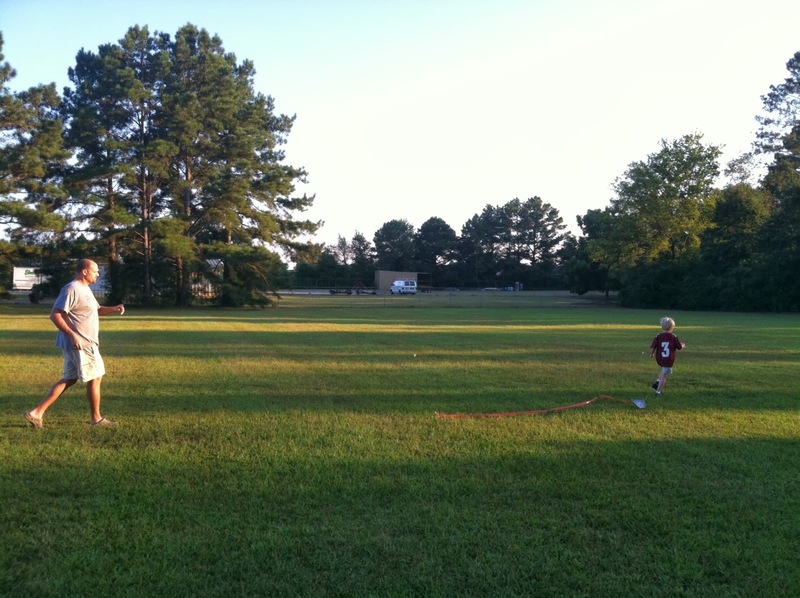 So one Sunday evening, our family headed over to the church for some kite flying fun. There wasn’t much wind, but B had a blast trying. 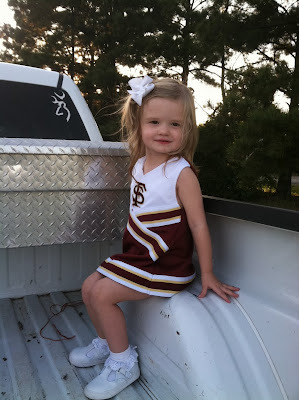 And of course, once C saw me snapping pictures, she had to pose for a couple as well. I love this girl!!! Hopefully with fall in the air, we will get some windy days soon that are better for kite flying! 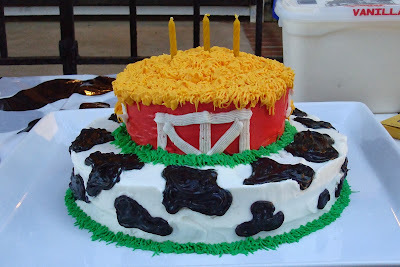 B’s third birthday was a farm theme which is pretty standard for this age and is pretty easy to do. I started with the invitations which I ordered from Vistaprint for a steal! They were super cute and with Vistaprint you can customize the wording, layout, font colors and styles. I was really happy with them. The table decorations were pretty standard. I found the cowprint tablecloth at Hobby Lobby, ordered the cowprint balloons online, and got the additional balloons from our local grocery store the day off. The hay bales were donated to us by a friend who has a few acres of land with hay. 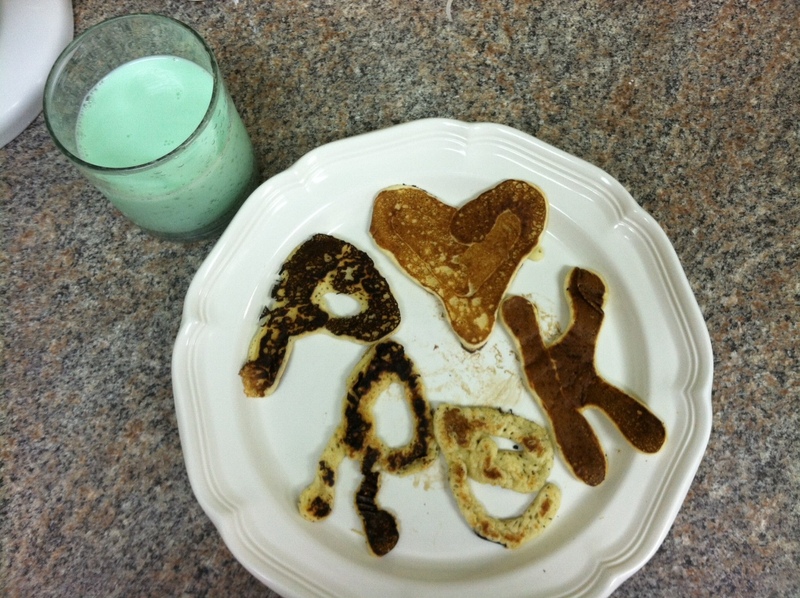 I stuck with pretty simple and easy foods–I mean, after all, I did have a 3-month-old baby! I served grilled hot dogs (thanks to the Hubs), chips, cake, and ice cream. I keep the drinks pretty simple too with juice boxes, bottles of water, and canned soda. I did the cake myself, and it is one of my favorites ever. There weren’t many planned activities or games. The kids pretty much just played in the yard with B’s toys. At the end of the party, I pulled out the little sandbox that was full of hay. I had hidden an ‘egg’ of Silly Putty for each child in hay. They had to race to find the egg which wound up being their party favor. 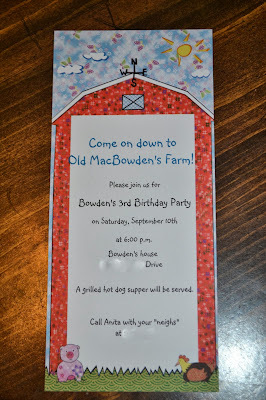 It was a fun party, and I really loved the farm theme. And my baby boy loved the party as well. I love to read…I mean, LURVE to read. I can completely disappear into a book. I don’t hear people talking to me, I don’t know what is going on around me, I can enter the world of the book and not come out for hours. And my favorite place to read is in the bathtub. And yes, my “not come up for hours” statement still applies. I can spend hours in the tub just adding more hot water when it gets cool and reading on. Now, since B (and especially C) was born, the “hours” in the bathtub has become more of an “hour every now and then in the evening after they have gone to bed or occasionally during their nap” type of thing. So, since my reading location is usually the tub, my book du jour can usually be found on the tank of the toilet. Not the most romantic place for a book, I know, but it is always right there waiting for me to grab it when I sink into the warm bubbles. So what has been on my tank lately? Water for Elephants was my most recent read–actually it never made it to the tank because I could not put it down! I read it in two days. And I also developed a bit of a love-hate relationship with it. Allow me to explain. I loved the storyline–hence the inability to put it down. The characters where intriguing, and I was completely captivated from the Prologue until the last page. And honestly, there were some one-liners that actually had me laughing outloud whether they were meant to be funny or not. So why the hate side of the relationship? I was pretty shocked by some of the content. I guess I am naive, but I had no idea the circus scene of the 1930s was so risque and racy. The language was rough at times, and the sexual content was extreme. So, for those reasons I would not necessarily recommend this book. I know I am a few years behind the times since this book–and even the movie–came out several years ago. And I have not seen the movie, but according to the really reliable website www.kids-in-mind.com, the movie is PG-13 and fairly safe to watch. So, what’s on your tank? Yesterday, we celebrated B’s fifth birthday with a Angry Birds fete complete with all of his favorite birds! 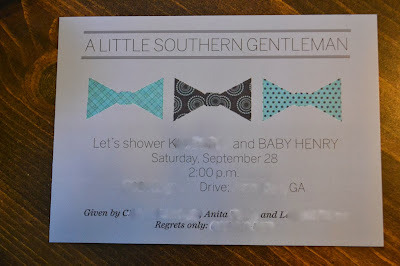 I found the adorable invitations, as well as the bunting, on etsy. The seller was really easy to work with and even sent me water bottle labels for free when she accidentally e-mailed me the invitations again instead of the bunting. So sweet of her–and she was very reasonably priced! This party required a good amount of ‘crafting’ on my part, but it was well worth it. 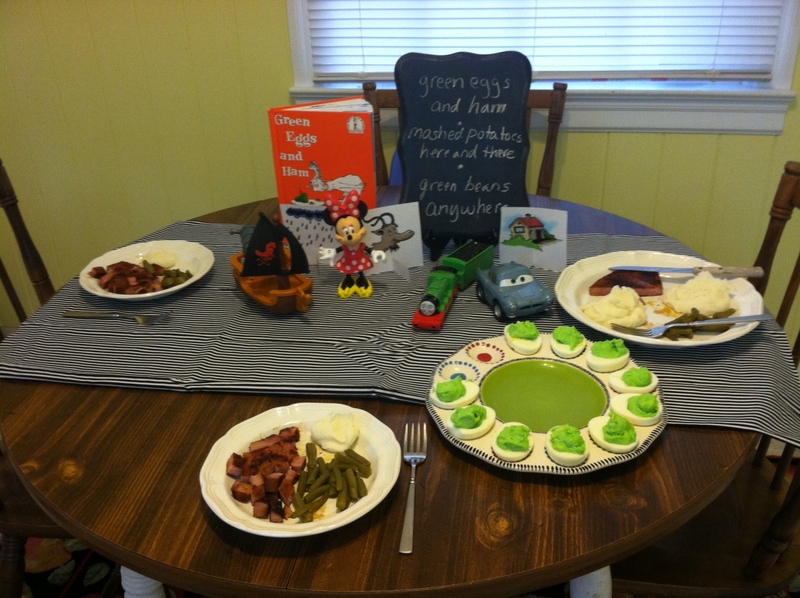 I made red bird, yellow bird, and green pig party hats for the kids, and they were a big hit. I followed the directions and used the free printable image at this link for the yellow hats. I could not find any packages of all yellow hats at any of my local stores, so I bought 3 packages of mixed color hats and made red and green hats as well. I used this link from the Party Animal blog for the printables for the red and green hats as well as many of the other images at the party. More on that in a minute. I found the pig table cloths, Angry Bird napkins, and red plates at the brand spanking new Party City that was built in a neighboring town that I am CRAZY excited about! That place has EVERYTHING! But I digress . . . I used the printable template from the Party Animal blog again to put the faces on the balloons (which I didn’t get a great picture of) and the face on the bowl of blue candies (also from Party City). I reused the blue and white striped cloth from B’s pirate party last year for the food table. Now, I have never professed to be an expert with party games–they are not really my forte. But this year the game was a HUGE hit with the party goers which ranged in age from 2 to 10! 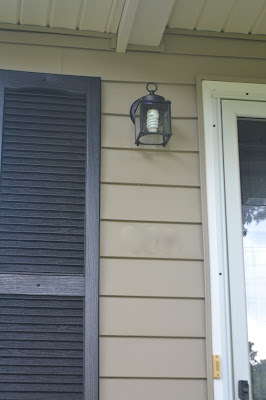 I used a set of 3 lime green paper lanterns that got at Hobby Lobby (with a 40% off coupon, no less) to make the pigs–once again using the printable from the Party Animal blog. I then went to our local liquor store and grabbed several empty boxes, Hubs spray painted them brown (cause nothing says ‘kid’s party’ like Budweiser and Jim Beam logos, right??) and stacked them up to make a real life Angry Birds game. The kids took turns throwing a ball at the set up to knock down the pigs. It was a blast, and I could hardly get them to stop playing when the pizza showed up. This was a PERFECT game because the kids could play on their own. Once all the boxes and pigs were knocked down, they could set it back up by themselves and keep playing. We ordered pizza from Domino’s (which showed up much later than I expected) and served strawberries, grapes, and baby carrots to make it a little bit healthier. I put fruit punch and apple juice boxes in the white tub to the right of the food table as well as cans of Coke, Diet Dr. Pepper, and bottled water on ice. I made cupcakes the night before (don’t get excited–Betty Crocker box mix to the rescue) and piped on some canned frosting. B helped me make the cupcake picks from another free printable. They were easy and got the job done. I served individual cups of Blue Bell vanilla ice cream. B blew out his five candles with some help from a friend and everyone enjoyed the dessert. After cake and ice cream, B was itching to open his presents. Which means queue the hoard of kids hovering around trying to catch the first glimpse of each new item being opened. I managed to get a really great picture of most of the kids before the end of the party. I think that this party was my favorite one yet. The kids loved it, and I really had a blast putting it together. Happy Bird-day, B! My sweet baby boy entered this world on my 26th birthday. I distinctly remember the midwife laughing and telling me, “You will have dinosaur birthday cakes for the rest of your life.” She wasn’t too off base from the truth. But my mom does a great job of making sure my birthday still at least stays mine a little bit. But this year, B and I had an especially fun day. The night before our birthday, I let him open a small gift from Hubs and me–a gift that meant that I would do something I didn’t think I would ever do. My name is Anita, and I bought not one, but TWO graphic tees from Wal-Mart for my child to wear. He got a Despicable Me 2 minion shirt AND and Angry Birds shirt. I knew he would like something special to wear on his birthday and for his party. Since he was turning 5, that means that for the first time he was really mature enough to make some decisions about what to do on his special day. So, wearing his new minion shirt, he went with me to drop C off with Pop and JuJu, and we had the whole day all to ourselves! Of course, he wanted a picture of himself with C (who insisted on wearing a yellow shirt as well) before we left. We headed straight to Waffle House for what wound up being more of a brunch than breakfast. 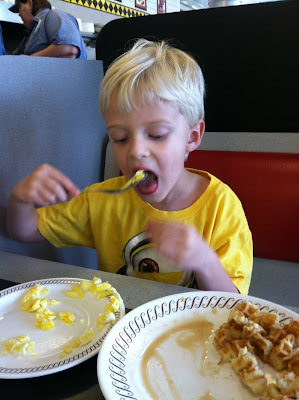 Waffle House is one of B’s favorite breakfast spots, and, well, I tolerate it. This may have been the first time in two years that B and I actually sat down and ate a meal alone. Just the two of us. And for this mama, it was wonderful. 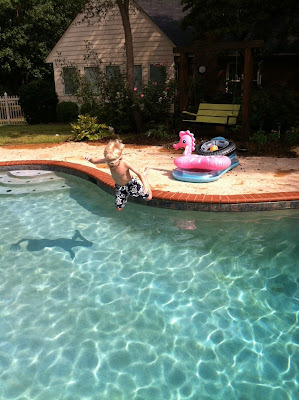 After waffles, he decided that he wanted to go swimming at “Memom’s pool.” Memom is a sweet friend from church who has opened her pool to us to use whenever we want. So I gave her a call and she said to come on by. Since B did so well with his swimming lessons over the summer, it was a pretty laid back way to spend the rest of the morning. He was jumping and splashing around, and I would soak and watch my little fish. After swimming he declared that he wanted Burger King for lunch, so we drove through and headed home for a quiet lunch and movie. Donned once again in his minion shirt, he watched Despicable Me and then went to bed for a nap while I worked on some final items for his birthday party. Hubs got home, and we met my parents with C and my brother and his wife at our local pizza place. Honestly, there where no frills, bells or whistles, but it was one of the best birthdays I have had in a long time. Five years ago today Hubs and I laid eyes on one of the most beautiful things we had ever seen–the face of our brand new baby boy. 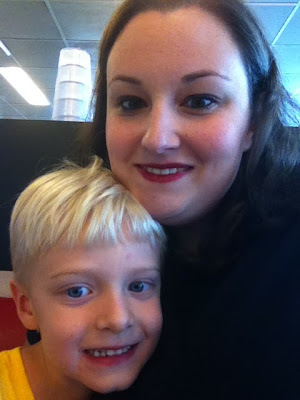 What an unbelievable joy it has been to be his mother for these last five years. His energy seems endless and his quick wit keeps us in stitches most days. Happy birthday to my birthday buddy! I love you so much! B and I focused on the book Green Eggs and Ham this week in school. This inspired our dinner tonight. I wish I had thought it through a bit more, because I wound up doing a lot of last minute stuff to get it all ready and that is not really how I like to operate. But anyway, here it it. 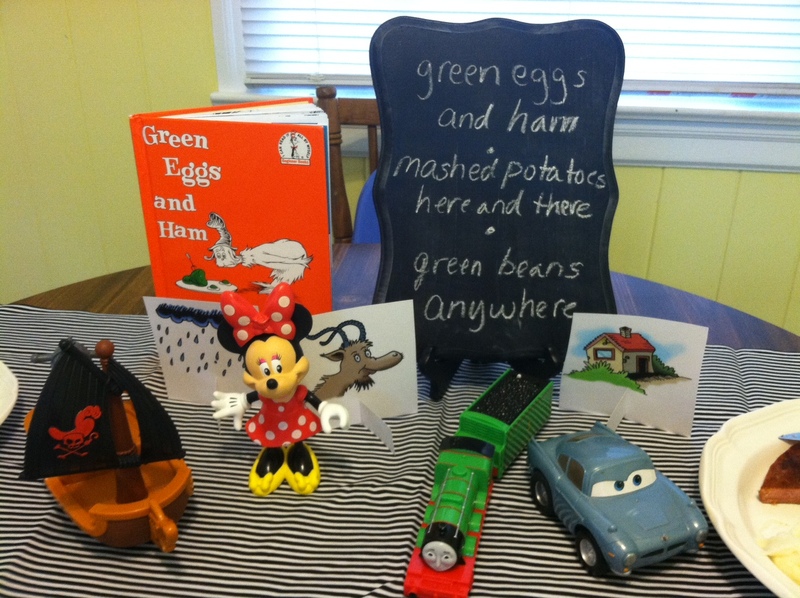 Because we spent a lot of time talking about rhyming words, I decided to pull some items from the play room that represented some of the rhyming words from the book. I also printed some pictures for words that I did not have a toy for. There was a picture to rhyme with each toy except one. While we were eating, B played the game of matching the picture with the toy. He is still trying to fully grasp the concept of rhyming, so this really helped him. 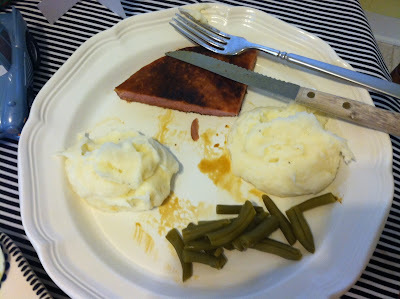 Our ham was just ham steak, and the mashed potatoes are in two places on the plate to represent being here and there. I made plain on deviled eggs and just added some food coloring to make them green. 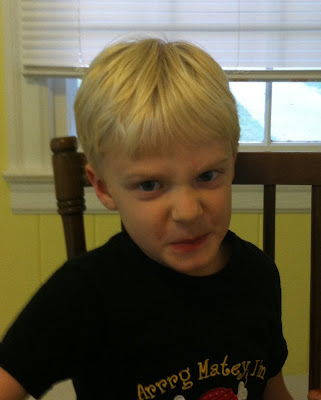 My notoriously picky and inconsistent eater B tasted one bite of egg, made this face, and deadpanned: “I do not like them Sam-I-Am. I will not eat them here or there. I will not eat them anywhere.” I thought I was going to fall out on the floor laughing. I had a lot of fun bringing it all together with this fun meal. I just hope I haven’t set a precedent. I don’t think I can come up with something every week! Today marks the first day of Pre-K for B. He has been excited about starting school for days, and this morning was no exception. He was in my bed and in my face at 7:00 this morning asking, “Is it time for school yet? Can we start school now?” So, with heavy eyelids, I got up and got ready to start our first day of pre-k! Then he got dressed and posed for his first day of school pic. Isn’t he adorable??!! So glad that he is excited about school. Labor Day was pretty relaxing for our family overall. The Hubs actually had the day off, so we got the house ready to be shown by a real estate agent and took the Hubs mom with us to brunch at Waffle House. 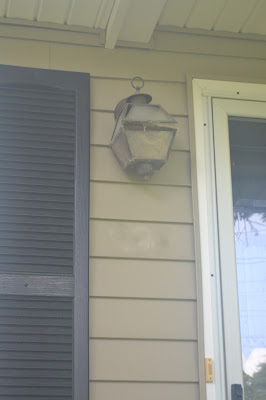 Then we started on the one project I wanted to get down ASAP–new exterior light fixtures. Now let me preface by saying that of the four exterior doors, three of the them have lights and all three of them were completely different and pretty old and hideous. I mean one of them had a bird’s nest in it for Pete’s sake! 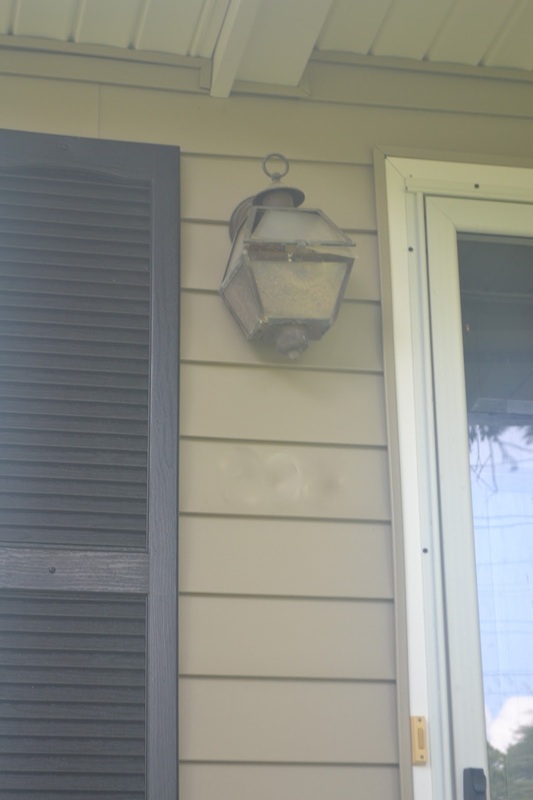 Due to the rather tight fit of the fixture in the top picture, we had to go with a smaller fixture that I would have preferred, but I am really happy with how they look. 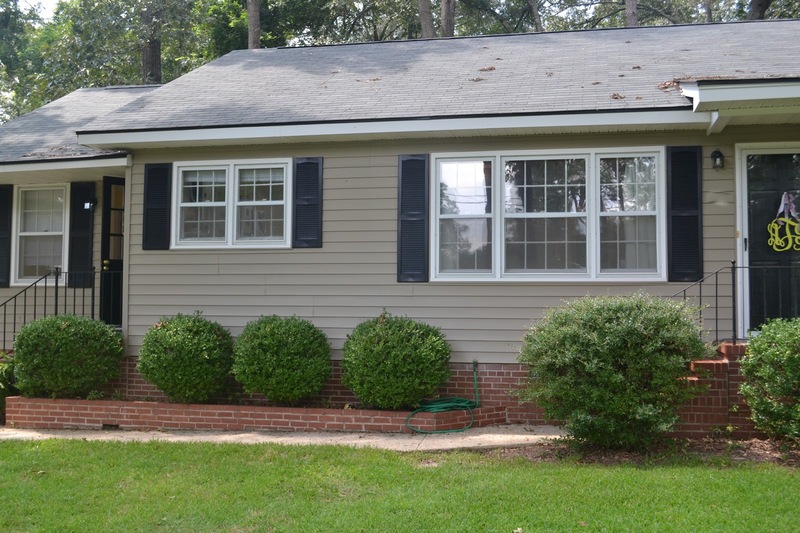 Good grief–they couldn’t get much worse than what we started with! And at less than $12 a piece after tax at Lowe’s, I couldn’t be happier! 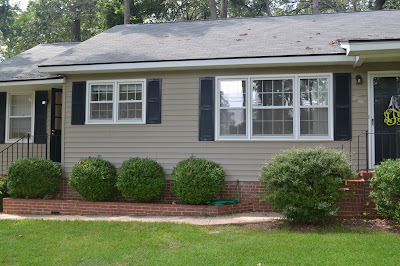 Now on to my next home project–kitchen window treatments.